Promotes bloom in roses and other flowering plants. Absorbed through the roots and foliage of plant. Epsom Salts is a source of Magnesium that is essential to plant development. It is required by plants to produce chlorophyll. It also helps plants absorb Phosphorus. What does Epsom Salts do for my plants? It is the only mineral constituent of the chlorophyll molecule, so it is essential for photosynthesis. If a plant is deficient in magnesium, its ability to carry on photosynthesis is decreased. No epsom salts, no plant. How can Epsom Salts be applied? Directly to the Soil: Apply ¼ cup Epsom Salts at the base of the shrub or tree early in the spring when new growth appears. A follow-up treatment may be made in the summer. This is an ideal application for roses. 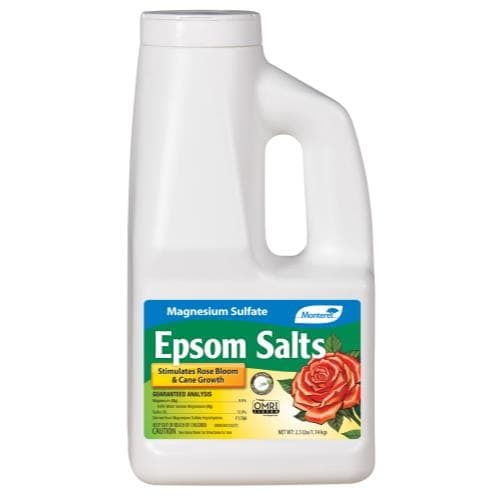 Foliar Spray: Mix ¼ cup Epsom Salts in 1-2 gallons of water and apply with your sprayer to cover 500-1000 sq ft.
What does the addition of Epsom Salts do besides correct magnesium deficiency? It enhances the color of blossoms and leaves, promotes new flowers and fruit, improves the root system, and improves the length of the stem. What is the main usage of Epsom Salts in the garden? Primarily, it is recommended on roses to improve the bloom. However, it helps any flowering plant. If a known magnesium deficiency exists, it is essential to correct it for healthy plant growth. How is Epsom Salts packaged? It is available in 4 lb containers.